Video provided by Marjorie Power. Dance to "Maggie Brown's Favorite Jig", Caller David Millstone. Dance to Carolan Tunes (English Country & Contra dances) to open the 7th Annual Carolan Festival. Location: Capital City (Montpelier) Grange Hall. Music by Festival Musicians. 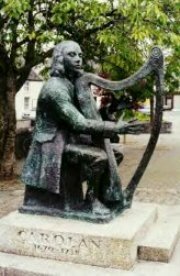 History of Irish harps and harpers; dance and vocal associations. Interesting bio. of Carolan, and traditional Irish and Baroque influences on his compositions. (Disagree with her definition of "Planxty"; only a very few were called Planxties by Carolan- not all tunes in honor of patrons.) Planxty probably was a term of his invention, per O'Sullivan. 2007 Carolan Festival, Worcester, Vermont - Loftus Jones by John Mallery (founder of our festival) on the keyboard and Emery Hutchins (former Angel Band member) on the bodhran. Footage by Bill Lynn, our festival's fantastic filmmaker.